The Grover Pro Percussion T2/GS 10" Double Row Tambourine features German Silver tambourine jingles, double mounted premium white skin head, captive pin system, staggered jingle slot configuration, solid hardwood shell, and reduced width grip. A free tambourine bag is also included. Grover's most popular alloy, German Silver resounds with a clear articulation that is bright, sensitive, and powerful. This versatie alloy is the choice of many classical players looking for a focused sparkle that's not too heavy in sound. German Silver is the most popular choice for all-around playing requirements. Great sound and feel! Superb quality. This is an absolutely great sounding tambourine. The German silver jingles really makes this instrument standout in timbre. The construction of this 10" tambourine is top-notch...solid, yet light in the hand. Just the right balance for the many methods of play required in the repertoire. The Grover Pro german silver tambourine is a MUST have for any serious percussionist or student looking to by his or her first tambourine. 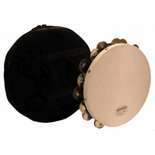 This tambourine can cover a wide variety of repertoire and is perfect first tambourine purchase. 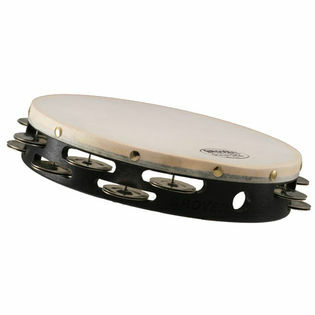 I find myself bringing this tambourine to almost every gig and audition.